The Deep Repair Masque works to replenish lost moisture in dry, damaged hair. The formulation of Macadamia Oil and Argan Oil are combined with tea tree oil, chamomile oil, aloe and algae extract, which work together to replenish your hair of any lost nutrients and restore your hair with natural goodness. Your hair will be left intensely nourished with increased bounce and shine. Macadamia Natural Oil Deep Repair Masque will leave you with long-lasting, conditioned hair. 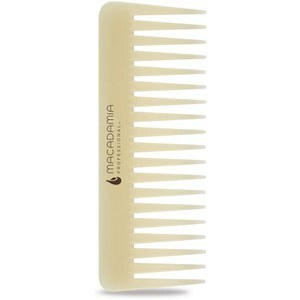 Receive a FREE Macadamia Oil Infused Comb when you spend £35 or more on Macadamia. It is a fantastic mask. Leaves hair soft, shiny and hydrated. I will definitely repeat it. it is fabulous hair mask, save my hair in cold winter day. I'm currently transitioning from relaxed to natural hair and needed a great conditioner that would work with both textures. After reading many great reviews about the product I thought I should try it out for myself. My hair has become incredibly dry during the transition and this conditioner has really helped moisturise my hair. After shampooing I towel dried my hair and applied the conditioner in sections. I let it sit in my hair and carefully finger detangled before rinsing out and combing the hair again. The result was lovely, soft, detangled, yummy smelling hair. I can't get enough of it! I have medium long colour treated hair with dry damaged ends. Whenever I use this Macadamia Deep Repair Masque it makes my hair feel like I just got a cut. The ends feel smooth and my hair is soft and shiny without being weighed down. I was surprised how little product I need since a little goes a long way. Macadamia Deep Repair Masque is an amazing product. Your hair is so soft! Highly recommend.